Enjoy the splendor & excitement of a McKenzie River rafting trip! The McKenzie River is one of the treasures of the Pacific Northwest. This Oregon gem is a classic alpine river high in the Cascade Range, with its headwaters located at Clear Lake. Cascading through a canyon blanketed in Douglas fir and old growth forest, this river is a crystal clear jewel with an abundance of dancing rapids. Its rich history and spectacular scenery make it one of the finest all-around rivers in Oregon. From picturesque waterfalls to stunning views of snow-capped mountains, this river is a fly-fishing and whitewater river rafting enthusiast’s paradise. To better suit our clients needs we have broken the river down into two main rafting sections: the upper portion, which begins at Olallie campground and ends at Blue River boat ramp, and the lower potion, which begins at Blue River boat ramp and ends at Thompson Lane. Our McKenzie River Rafting trips begin at the 2 highest possible access points. These are the only launches located in the protected and designated "wild & scenic" raft-able section of the McKenzie River. This area located below Olallie and Frissell boat launch are by far the most pristine, beautiful and exciting portions of the river. When booking your rafting trips, ask if you will be experiencing the sections above Paradise campground. During the summer months we offer 3 primary McKenzie river trips assuring a perfect river based adventure. Our 1/2 day 14 mile rafting trips are offered twice a day. Once at 9:45am and again at 1:30pm. Our full day 22 mile rafting adventures which offer an extraordinary river side lunch served by your guides. This trip meets at 9:30am, return times vary since it's your day on the river but tend to return between 3:45pm and 4:30pm. Spring river trips, generally before memorial day and Fall adventures after labor day we condense our 1/2 day trips to a mid-day adventure meeting at 11:30am, full day trips still meet at 9:30am this time of year. 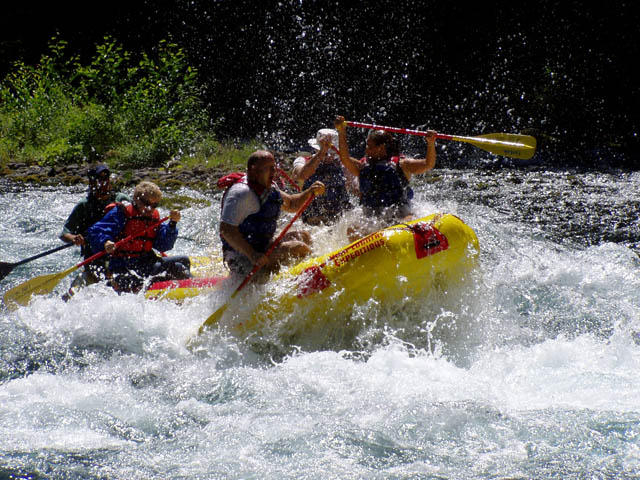 We guarantee that our McKenzie river rafting adventures are the finest and most complete from an outfitting and enjoyment perspective, as well as one of the lowest priced. The reason High Country can offer such great deals on our McKenzie River Whitewater rafting and scenic river trips, is that we are based here, and this is our "back yard". With this advantage we are able to greatly cut our travel expenses and pass that saving directly on to you, our guest. Upper McKenzie River Rafting, McKenzie river whitewater, and Rafting adventures near Eugene & Bend Oregon with High Country Expeditions. Oregon's McKenzie river rafting trips. Our Signature trip, located near Eugene, Sisters & Bend, is the perfect family whitewater experience for all ages. Come experience the splendor if this Oregon gem!